Atomic Robo is a Shadow fan! Atomic Robo is a comic book that pulp fans should love. Its pages are infused with that very important ingredient most comics today are missing: FUN. 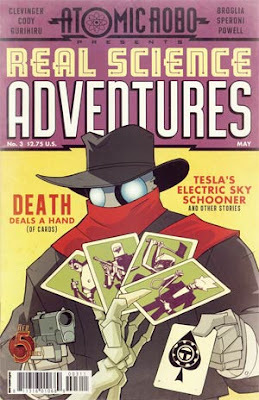 Published by Red 5 Comics, written by Brian Clevinger and drawn by Scott Wegener, Atomic Robo is a hero built by Nicola Tesla to battle evil in all its forms. His adventures range from World War II to the present as he battles Nazis, Commies, and bad robots of all stripes. And clearly, if this cover for companion magazine Real Science Adventures is any indication, pulp fans should love Atomic Robo because he's a Shadow fan! 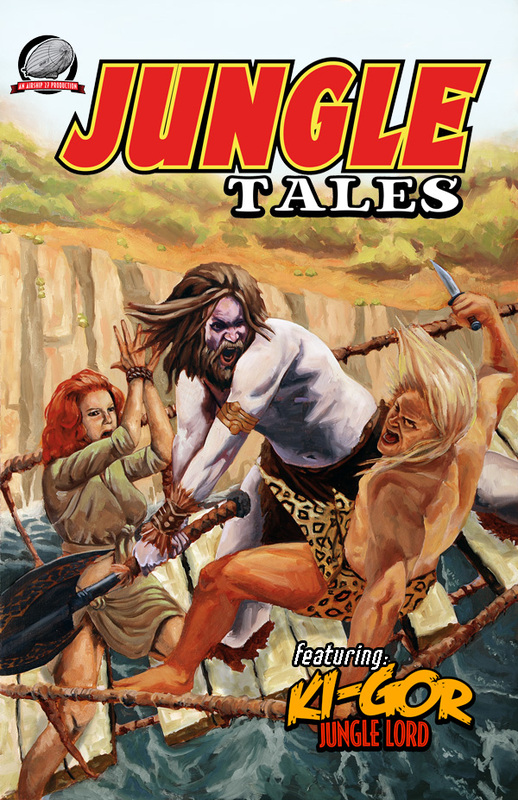 According to Barry Reese's most recent compilation, the print edition of Jungle Tales Volume 1 debuted on the New Pulp Best Seller List at # 5! Jungle Tales Volume 1, which includes my Ki-Gor story, "The Devil's Nest," is now available at Amazon . . .
Tarzan of the Apes, A Romance of the Jungle, by Edgar Rice Burroughs, appeared in its entirety in the October 1912 issue of The All-Story Magazine. The jungle adventure genre captured the reading public in a flash. I'm contributing to the Tarzan Centennial with a novella in a new anthology: Jungle Tales, Volume 1, from new pulp publisher Airship 27, features three stories about popular jungle hero Ki-Gor. My story, "The Devil's Nest," finds our hero searching for a lost American heir, encoutering a lost tribe of warriors, and battling a squad of mercenaries hunting down the lost gold mines of Ophir, the source of King Solomon's gold. This action-packed anthology also features stories by Aaron Smith and Peter Miller, a bold painted cover by Bryan Fowler, and interior illustrations by Kelly Everaert. The eBook version currently is available from Airship 27's Hangar, which you can reach by clicking here. A print version will soon be available. 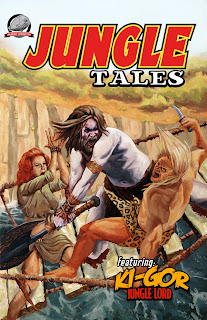 Airship 27 Productions, a leader in the New Pulp Fiction movement, is thrilled to announce the release of their latest title, JUNGLE TALES Vol. One. One of the most popular sub-genres of the classic pulp magazines were those with jungle settings. 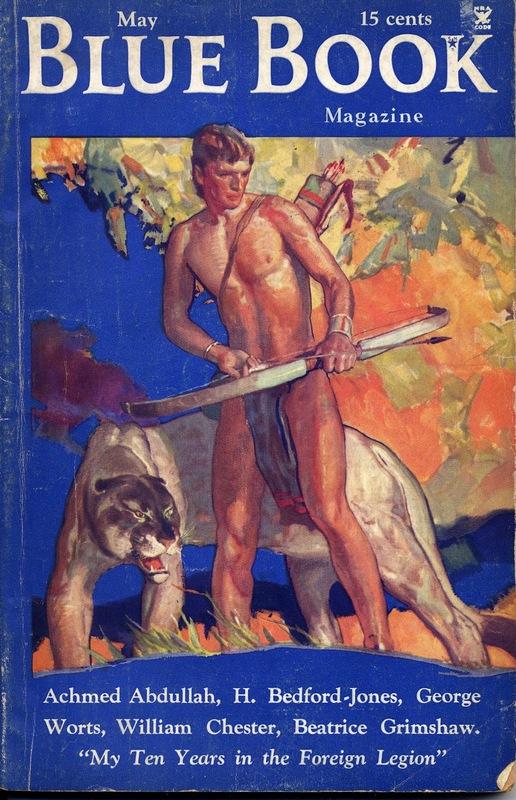 With the success and popularity of Edgar Rice Burroughs' Tarzan stories, editors began clamoring for similar tales featuring jungle heroes. Soon dozens of cheap loin-cloth wearing imitators were popping up everywhere, including a few jungle queens to add spice to the mix. By far the most successful of these Tarzan clones was the blond-haired Ki-Gor, the Jungle Lord whose adventures appeared regularly in the pages of Jungle Stories magazine. Now Airship 27 Productions offers up this new collection with three brand new adventures of Ki-Gor and his lovely, red-headed mate, Helene, as they travel into the mysterious, uncharted jungles of Africa. Penned by Aaron Smith, Duane Spurlock and Peter Miller, here are a trio of fast-paced tales that have the Jungle Lord discovering a hidden village of Vikings, crossing paths with dinosaurs in a lost valley and battling cannibals to save the life of a benevolent jungle princess. This is the pulse-pounding action and thrill-a-minute adventure fans have come to expect from the classic jungle pulps. “It’s hoped,” said Managing Editor, Ron Fortier, “that each new volume of this title will shine the spotlight on a different classic pulp jungle hero. Maybe even a jungle queen or two.” This premier features a stunning cover by painter Bryan Fowler with magnificent interior illustrations by Kelly Everaert. JUNGLE TALES Vol. One kicks off another new series pulp fans are sure to appreciate and enjoy. And remember: the weed of crime bears bitter fruit! Blue Book is one of the few pulps I actively seek to collect. Other magazines may catch my interest because of an artist or a particular author included within its pages, but if I ever collect an entire run of a magazine, it's likely to be Blue Book. Besides the fine reading most issues offer, Blue Book is a fine-looking package. Excellent interior illustrations were a given for this periodical, and the judicious use of spot color with those interior black-and-white illustrations were quite a surprise to my eyes the first time I opened up one of these issues. In this particular issue -- for May 1935 -- among the top-notch illustrators featured within are Henry Thiede, the remarkable Jeremy Cannon, Bert Salg, Herve Stein, Monte Crews, Alexander deLeslie, and the amazing Austin Briggs. "The remarkable Jeremy Cannon" is actually Herbert Morton Stoops, long-time cover artist for Blue Book, and painter for the cover scan accompanying this post. For all, or most, of Stoops' interior b&w art for Blue Book, he signed off as Jeremy Cannon. I don't know the story that explains why Stoops used a different name for his interiors -- perhaps David Saunders or Mark Wheatley or another pulp-art scholar knows the scoop. I know that Stoops used his actual name when providing black-and-white line art for other publications, such as The Cruise of the Dry Dock by T.S. Stribling, Stories of the Sioux by Luther Standing Bear, and other books. Stoops' painting for this issues features William Chester's Kioga, as this issue includes a section of the serialized Hawk of the Wilderness. Certainly the required azure that appeared on every cover of the magazine seemed at times a constraint to the artist, but Stoops demonstrates a mastery of color by use of a bright palette that sets off his figures, despite the rich blue that surrounds the composition. Stoops' figures are always amazing to me. When I look at his work, I get the sense that he painted with the eye of a scultor: his figures convey mass, and the weight of his strokes coupled with the rounded lines of the figures lend a feeling of sculpture to the figures he depicts. One can discern this element in some of N.C. Wyeth's paintings, but Stoops' work nearly always imparts this impression when I look at it. JulesVerne is sometimes called the grandfather of modern science fiction. That's not exactly accurate. Verne’s novels typically don’t extrapolate into scientific technology beyond what was actually available at the time he wrote them. Instead, Verne was more of an adventure writer, whose novels are grounded in the world of science. They also were tales of adventure in exotic settings. His scientist-protagonists prefigure many of the heroes that later populated pulp magazines -- Doc Savage, Captain Future, and many of Robert Heinlein and Van Vogt's science heroes -- as well as later, pulp-influenced characters like Batman, the Challengers of the Unknown, Reed Richards of the Fantastic Four, and others. 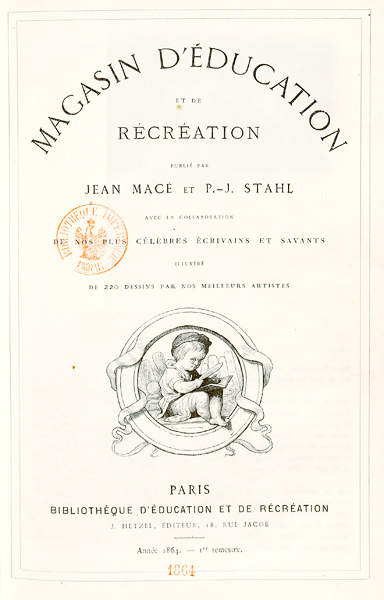 Also, many of Verne’s novels originally saw print as serial publications in a magazine published by his book publisher, Jules Hetzel, and titled Magasin d’Éducation et de Récréation. So, Verne is linked to the pulp writers of the 20th Century by the medium his work first appeared before the public. Hetzel would serialize one of Verne's novels in the Magasin, then the collected chapters would be published in book form by Hetzel under the series umbrella, Voyages Extraordinaires. 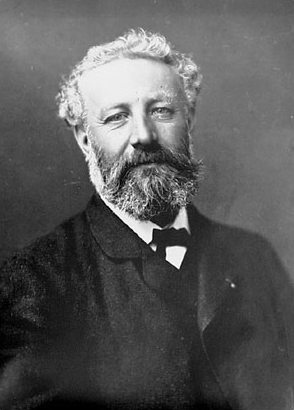 As stated on Wikipedia (but which I've seen quoted other places as well), "Jules Verne remains to this day the most translated science fiction author in the world (second only to Agatha Christie as a fiction author), one of the most continually reprinted, and the most widely read French author. Though often scientifically outdated, his Voyages still retain their sense of wonder that appealed to readers of his time, and still provoke an interest in the sciences among the young." More than fifty volumes of the Voyages Extraordinaires were published. Verne's enduring popularity more than a century after his death is evident in the new translations of his works that continue to appear -- in recent years, a number of his novels have appeared in English for the first time.